How do you run 13.1 miles? Plain and simple: I do not. WHAT?! I repeat…I do NOT run 13.1 miles consistently. I am a big fan of Jeff Galloway’s run-walk-run method and have stuck by it for years. I feel better, my splits are better, and I run injury free when I use this method and most of all – I can finish a half marathon! Many of the “Couch to 5K” programs are based off of this method and many marathon training program follow the method as well. It’s not “new” to the world of running by any stretch of the imagination, but it is gaining popularity with new runners. “The continuous use of the running muscles will produce fatigue, aches and pains much more quickly. If you insert a walk break before running muscles start to fatigue, the muscle can recover quickly — increasing your capacity for exercise while reducing the chance of next-day soreness. The run-walk-run “method” involves having a strategy. By using the right segments of running and walking, for the individual, it’s possible to manage fatigue. At the end of a marathon the muscles will be tired, but correct use of walk breaks from the beginning will mean little or no slowdown during the last six miles. This is the portion of the race where most runners slow down dramatically and walk a lot. You can easily increase your millage from 1 to 3 miles to 6 to 10 miles by giving yourself those short walk breaks. Those walk breaks help you slow your breathing and rest your muscles. Because of the rest you will be less sore the following day (always a plus!). The calorie count for 90 minutes of running and 90 minutes of the run-walk-run strategy are the (basically) same. You can constantly transition between different run:walk paces and can eventually phase it out if you become comfortable running longer distances without the break. The stigma. Sometimes I don’t feel like “a real runner” when I need to take a 30 second walk break 2 minutes into a run. That’s mental! One day I hope to easily run 13.1 without stopping, but that’s not for me. Above is photo of one of the first times I really “tested” the Run-Walk-Run method. I used the 2:1 for a 12 minutes mile goal to make sure I would be able to sustain it for me half marathon. I was happy to come in under 12 min/miles for my first two mile splints (pictured above). The biggest “pro” for me is the decreased strain on my very-tight IT band. I would need to stop and stretch with runs anyway – but the RWR method allows me to run and instead of needed to stretch every big…simply walk it out for a minute! My IT band relaxes and it allows me to run pain free for the next 2 minutes…then repeat. So you use the run-walk-run method? What are your thoughts? 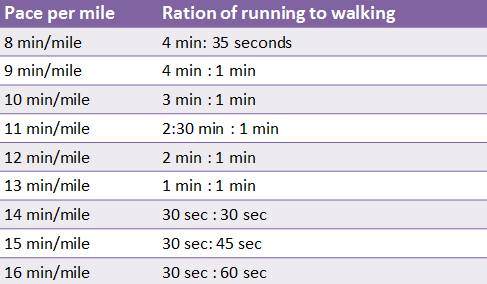 What pace to you use? Share them! It’s great for recovery as well! I find that with races that I use the RWR method for I am in very little pain the next day 🙂 fresh legs = more miles! 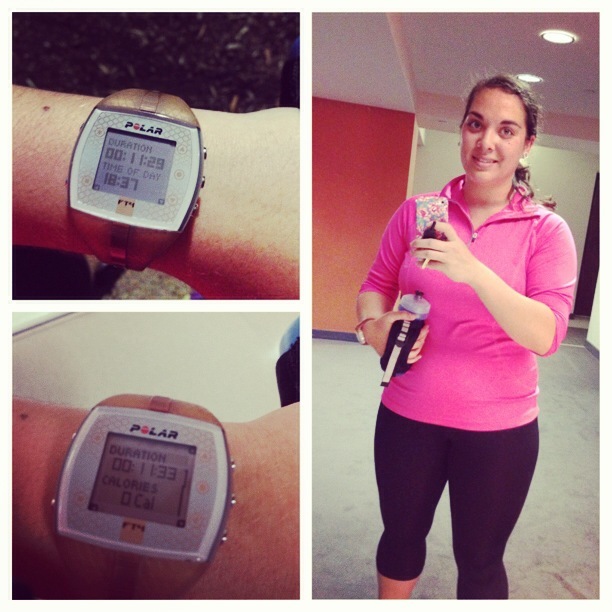 I started using the RWR method while I was training for my first half due to knee pain. Now I’m training for a marathon and still doing RWR. I have way less pain with RWR and running really long distances feels a lot less daunting with RWR because you only have to get through the next running interval, not through the next 15 miles. I 100% agree! It is so much easier to look at my watch and say “just 2 more minutes” versus “just 2 more miles” 😀 best of luck training! NextLast Race of 2013 and a #RaceRagz Giveaway!